Driving while impaired by alcohol or drugs is among the most common causes of truck accidents. Big rig accidents have the potential for catastrophic injuries and death, even at low speeds. 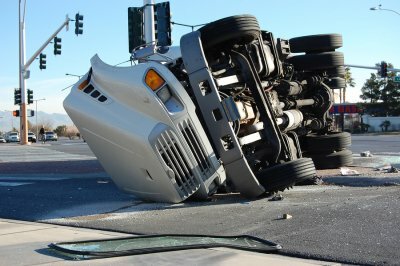 If you were injured or you lost a loved one in a big rig crash, contact an accident lawyer in Riverside promptly. You may be able to file an accident lawsuit to hold the negligent truck driver responsible for his or her actions. Commercial big rig operators are professional drivers who are supposed to be appropriately screened and trained. It’s often thought that truck drivers are less at risk of driving while under the influence of alcohol compared to others on the road, but unfortunately, this isn’t the case. As your accident lawyer can explain to you, a truck driver can be charged with DUI if his or her blood alcohol concentration (BAC) is above a certain limit. In most states, this threshold is typically half the BAC limit for non-commercial drivers. Truck drivers are routinely tested for alcohol impairment after accidents. If they refuse, according to the rules established by the Federal Motor Carrier Safety Administration (FMCSA), the resulting penalties are roughly equivalent to pleading guilty to DUI. Criminal investigations of truck accidents proceed separately from accident lawsuits. However, a finding of DUI under criminal law can become an important factor in civil trucking litigation. Truck drivers are held to higher safety standards than non-commercial drivers, but this doesn’t mean they are immune to the dangers of substance abuse. Some truck drivers may operate big rigs while under the influence of marijuana , which can be particularly dangerous because it can induce sleepiness and inattentiveness. Others may take illicit stimulants in an effort to stay awake during the long hours on the road. An accident lawyer can obtain evidence, such as the police report, to determine if substance abuse might have been a factor in the crash. It isn’t just illicit substances that can impair a truck driver’s abilities. Many prescription drugs can affect alertness, reaction time, judgment, and perception. Truck drivers are required to undergo intensive medical evaluations to determine if any medical conditions or medications might affect driving ability. An accident lawyer can investigate whether a truck driver failed to comply with these requirements.